Pucon is a pretty resort town situated on Lake Villarica, set against the looming backdrop of the live Villarrica Volcano. The town has excellent tourist infrastructure and is one of Chile's most popular domestic holiday destinations. Surrounded by one private park and two national parks, Pucon is the focus of the Lake District's adventure tourism industry and is a growing centre for outdoor sports including hiking, kayaking, whitewater rafting, windsurfing, horseback riding and mountain biking. More relaxing outdoor activities in Pucon include fishing, birdwatching, soaking up the sun on the lakeshore, or bathing in the nearby hot springs. In the winter months, skiing and snowboarding in Pucon are the major attractions, and the resort is one of the few places in the world where visitors can ski on a live volcano. Travellers should note, however, that although the conspicuous activity of the Villarrica Volcano is delightful in some ways, it also means that adventures on the slopes of the volcano are sometimes suspended due to the volcanic activity. The last serious eruption was in March 2015. Skiing in Pucon revolves around the Villarrica Volcano, making it one of the few places in the world where you can ski on an active volcano. Prior to the 2015 volcanic eruption, the resort boasted about 10 major runs, served by a number of ski lifts as well as several natural half pipes; however, the slopes were never opened in 2015 and it is unclear when the resort will once more function at full capacity. When the ski slopes are open, facilities for ski and snowboard equipment hire and a ski school are usually available. Apart from the off-piste options the resort is simple and the slopes are best suited to beginners and intermediates. The views from the slopes are sublime. It's seldom a good idea to shop too extensively in a resort town as the prices are generally higher, and the range more generic, than in less commercialised towns and rural areas. In Pucon there are plentiful high-quality carvings, textiles and leather goods and the range is impressive but cheaper crafts can be found outside of the little town. There are a few charming little bakeries and a some big supermarkets in Pucon for those choosing to self-cater. Hordes of hungry tourists have ensured a lively and diverse restaurant scene in Pucon. There are plenty of international staples available (foods like pizza and burgers are popular all over Chile) but there are also some more authentic eateries offering local cuisine. It is possible to eat cheaply or to splurge, depending on budget. The nightlife is Pucon is usually lively, and the town has the reputation of having something fun to do 24 hours a day. Evenings out in Pucon generally involve plentiful food and oversized beers, and although the nightlife is energetic, it isn't generally sophisticated. There are one or two more stylish venues though. Many bars and nightclubs are open only in summer (November to February) which is the peak tourism season; the town is much quieter during the winter months, though there is always somewhere to get a drink. Pucon is ideally situated for adventure sports and outdoor activities, as it is framed between a mountain and a lake, and is on the cusp of two national parks and one private reserve. In summer there is whitewater rafting, hiking, hot springs, fly-fishing, birdwatching, horseback riding and volcanic trekking. Winter activities centre around skiing, snow-boarding and relaxing about in the restorative hot springs. There are numerous tour operators based in the town and organising activities is easy. 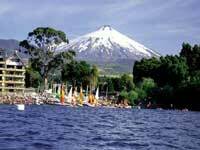 Pucon can get crowded so accommodation should be arranged well in advance in the peak summer months.